Crate training makes housebreaking quicker and easier than any other method. But, that doesn't mean you can't run into trouble, or that you won't have questions. This page features a selection of real-life questions I've been asked by puppy-owners just like you. I've picked ones that deal with the most problems which crop up most often. If you're struggling or just concerned, chances are you'll find someone else has been there too! At the bottom of the page you'll find links to pages on my site which have detailed information and advice on crate training, general housebreaking, separation anxiety and more. We have had our female Pomeranian for a little over two months and it seems like the crate training is going nowhere. She is about 5 1/2 months old now and still consistently pooing and peeing in her crate. The worst part is, she rolls around in it so when we come home she is covered in feces/urine so we've had to bathe her daily. I read today that her crate shouldn't be any bigger than just to allow her to lay down and that if it's any bigger, the pup may begin to walk/track waste and then there is a bigger problem because she is no longer bothered by eliminating where she sleeps.....is this true? Her crate is a bit bigger than recommended, but not by much (maybe about three inches longer). How do we correct the rolling-in-waste behavior now? Is it too late to buy a divider and start from there? She is consistently going to the bathroom outside but has no problem going inside, too. Please help! I'm sorry to hear about the difficulty you're having with your puppy. This is fairly rare, but some puppies do seem to be unfazed by the fact that they are eliminating in their 'bedroom', and don't mind walking, lying or even playing in their pee/poop. Sometimes it's because the original breeder had less-than-hygienic conditions and the puppy got used to being dirty, other times it's simply a habit the pup has got into and his/her natural distaste for this behavior has been over-ridden. It's definitely going to be a challenge for you to keep her clean, but by 5 1/2 months old she should have reasonable control of her bowel and bladder. First of all I would have her checked out to make sure that there's no physical problems that could mean she has a loss of control of her elimination functions. Very occasionally there can be a nerve problem, or a muscle weakness, and it's always better to be safe than sorry. If she checks out 100% healthy, then I would recommend going out and buying her a new crate (doesn't have to be an expensive one) that is not even a little bit too big. This will take away the issue of her having that extra room, plus the new crate won't have any remnants of the odors she's created by regularly soiling the old one, so she won't find a scent-trigger to encourage her to eliminate in there. Generally I don't recommend pee pads or a litter box, but I'm inclined to do so here and take the crate out of the picture during the daytime. You need to break this bad habit of hers and changing the crate and her daily routine may help. If you have a safe fenced yard you could also try adding a doggie door so that she can run in and out on her own when you're not home. If that's not possible you may want to try leaving her in a puppy play pen with a doggie litter box during the daytime rather than her crate. Then just use her crate at night time and have it in your room with you so that if she cries or starts fussing around you can take her outside. The biggest challenge here is to prevent her from having the chance to start this habit up again in the new crate. If you can give her time to 'forget' that she used to soil her crate and build a new habit of only doing her business outdoors (or in a doggie litterbox) then you should be well on the way to success. Small and tiny breeds can be a bit more difficult to housebreak than some larger breeds, but with the right training, patience and consistency they do get there eventually. You may want to check out my Types Of Small Dogs page as it has lots of info. on raising them, plus links to some great 'indoor dog potties' for tiny dogs and to pages that deal specifically with tiny dogs, such as my Pomeranian Care page. I hope this helps and wish you the very best of luck with that adorable little girl of yours. Susan, thank you so much for your wonderful advice.....what you say makes a lot of sense. I will let you know how the new crate works out for Francesca! Hello,I had a similar issue with a new mini poodle puppy. He didn't mind eliminating in his crate. Unfortunately when I got him, I put pee pads in his crate, which was a big no no, which I later learned. After this I had to break the habit of him being comfortable with eliminating in his crate. I made it smaller, just enough space for him to turn around and lay down as recommended, but it didn't work. I had to purchase a doggy fence to create a confinement area for him. I placed his crate there and pee pads (which I was trying to avoid using). I needed to break him from the habbit of eliminating in his crate and it worked. He knew right away what the pee pads were for and does very well with this. I also take him outside to "potty" when Im home. I got him when he was 7.5 weeks old and now he is 15 weeks old. He sleeps through the night now and tends to wait for me to wake up to take him outside (unless my toddler wakes up at night which consequently wakes him up). Once he gains more bladder control I will eliminate the ex-pen and puppy pads all together, but probably not for another 1-2 months. Our 8 month old yorkipoo eats last meal before 5:00 p.m., goes willingly into crate (on our bed) when we go to bed around 10:00 p.m. then wakes us up around 2:00-3:00 a.m. with small whimper and has usually already pooped in crate. Her crate is small enough for her to turn around in so I don't think it is too large. Occasionally, she whines and I take her out but she rarely poops then. Just a week ago she had very loose stools and was straining to go. I'm feeding her less and only twice a day now. She does not get any treats as we're trying to pinpoint the problem. 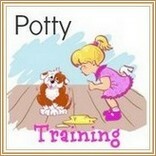 Puppies are creatures of habit and it seems as though your little girl has got into the habit of pooping in the night. She's a small breed pup, and they do tend to need to 'go' more often as they have a fast metabolism, but at her age I would think it's unlikely that she absolutely HAS to poop in the middle of the night. I'd suggest ruling out any digestive problems, if her stools are often 'soft, unformed or liquid', and she seems to need to go a lot during the daytime, she could have a health issue or a food intolerance/sensitivity. If you think this might be the case, talk to your vet and ask for advice. Also, make sure she is eating a premium brand dog food (check out my 10 Best Dog Food Choices page for more information on this. Poor quality foods contain a lot of basically 'undigestible' ingredients and a pup on that sort of diet will need to eat a lot more, and poop a lot more. The stools will also be larger, and probably smell worse! If all these things are okay, then it may be that you need to wake up BEFORE she does for a week or so. Set your alarm or whatever and anticipate her needs. Take her out before she starts to complain, and keep her outside until she does her business. Don't make these midnight trips a social occasion though, no eye contact or talking. It's business only. Double check her crate is the right size. She should be only able to stand up, sit down, turn around and lie down in it. No more. If it's bigger than this, get her another one. If none of these measures help, I'd recommend asking your vet for advice, or maybe talk to a local dog trainer or dog behavioral specialist. They may be able to figure out what is going on. I wish you the best of luck and hope you get this under control soon. I am in the process of crate training an 8 week old Bernese Mountain Dog. He howls for the first 15 minutes but then typically quiets down. He seems to be getting more used to it. Currently, I am setting my alarm and waking up every 3 hours to take him outside to go to the bathroom. Am I doing more harm than good by doing this? I take him out before bed and make sure he there is no water after 7 (his night time feeding), but he seems to go in small spurts (I take him out, he goes, then becomes interested in something else and will not go until he gets back in the house or gets taken out again!). Any tips or advice would be extremely helpful, even visiting him once in the night would be better than 2 or 3 times. It sounds as though your on the right track with your pup, and although it is exhausting to get up several times in the night, it's preferable to having your pup mess in his crate and possibly put a set-back in your housetraining process. At 8 weeks old, pups have very elementary control of their bowels and bladder, but do make an effort to 'hold it' whenever possible. Problem is they can only hold it for a short while. Does your pup make any effort to let you know if he needs to get out of the crate to eliminate? Some pups will whine and cry and get quite distressed, others will simply utter one whine (or none at all) and then 'go' in the crate. If your pup gives you some warning that he needs a potty break, I'd suggest putting his crate where you can hear him at night, and aiming for a maximum of two night-time elimination trips. For example, if you and he head off for bed at 10:30pm, set your alarm for 2:30am and take him out, then re-set it for 6:30am - 7am depending on when you normally get up. If your pup wakes you up crying before the alarm goes off, then take him outside and let him pee/poop, and aim for the next alarm time. It's really a matter of trial-and-error and as all pups are different there's no one size fits all rule I'm afraid. By 10 - 12 weeks he should only need one nocturnal potty break, and that shouldn't be necessary for too long. Crate Training takes time and patience, but it's definitely the best way to go and I think you're both doing great so far. Best of luck with your pup. Our 8 weeks old puppy, Doogan is doing very well outside of his crate, he hasn't had an accident yet. However, as soon as we try to put him in his crate he whines/barks and then after about 5 mins he poops. Then we take him out, give him a bath and take him outside. What should we do? 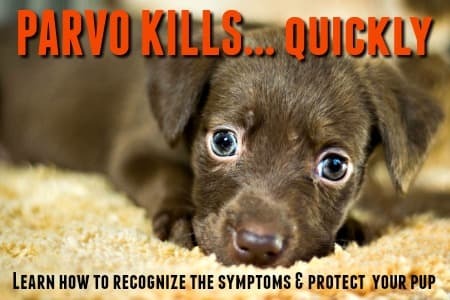 It doesn't sound as though your pups' problem is as much one of control, as of anxiety. Many pups dislike their crate at first, and because it physically separates them from the rest of their 'pack', they can get very anxious. Separation anxiety is pretty common, and Doogan will likely 'grow out of this' as he gets more familiar with his crate, and gains in self confidence. Although Doogal is pooping because he's upset and scared (and therefore doesn't have good control over his bowels/bladder), if you can make sure that he's as 'empty' as possible before crating him that will help. Of course, he's only 8 weeks old and will have very basic control anyway, and he won't be able to 'hold it' for long. You will need to be very patient and consistent with him, and help him to get used to his crate slowly. Housebreaking is an ongoing process for some months, but if you stay positive, loving and patient, your little guy will soon get the hang of it all. We recently added to our already busy household by getting a lab puppy. We have been attempting crate training since we got her (almost 2 weeks ago). We have mainly used it at night as I am home 99% of the time and our 5 kids spend so much time with her. Also, when we put Poppy in her crate, she will cry for hours...literally. Not just minor whimpering....high pitched shrill/barks. She is still quite young, will be 8 weeks old this Saturday. My husband and I are literally at our wits end during the night hours. Our first night bringing her home, my husband slept on the floor with her as we felt sorry for her being away from her parents. The next night, we got up with her every 90 minutes or so for pottying. One night she went for 7 1/2 hours and we thought she was finally used to the crate. The next night it started all over again and she was yelping/barking for hours...every time we would put her back in the crate. We moved from a travel crate to a wire crate recently thinking maybe if she can see out better that may help....nope. We had the crate in our room....no help. We used a sound machine with heartbeat....nothing. We so love our puppy yet she is soo spoiled with being with us all the time, I fear this is what is causing the night time issues. I told my husband that maybe we should put the crate in the basement so that her loud yelps don't keep awake or wake up our entire family. Could you please help us or give us any advice? Your puppy is absolutely adorable, what a face! I know this probably won't be much solace right now, but what you're experiencing is pretty normal, and your puppy is a very tiny baby right now. 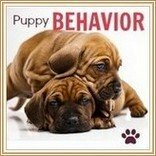 Puppies shouldn't leave their momma and litter mates until at least 8 weeks of age and as it sounds as though she came to you at about 6 weeks old, this probably accounts for some of her extreme distress. Considering her age she is actually doing well. All her natural instincts are telling her (very LOUDLY) that she needs to be with her 'pack' and in the wild this is what would keep her safe. She's only a baby and these instincts are what is ruling her behavior right now, you and your family are her pack and she's afraid when she's parted from you. However, puppies do need to learn to stay in their crates, and to tolerate short separations from their other family members, but it takes time, patience and consistency to achieve this. I'm mom to 6 kids myself, and have always had a small 'zoo' of pets too, so I can totally appreciate how busy you all are and how tiring it is to have a pup who keeps everyone up nights. But, this is just like the stage that human babies go through at first, and just as that passes as the baby matures, as your adorable puppy girl matures so will this. I'd recommend that you begin to use the crate for short periods during the day, in a place where she can see and hear family life going on around her. She will most likely still complain and fuss about being crated, but you just have to ignore that. Never let her out of her crate while she's crying... wait for a lull in the complaints (even if it's only 30 seconds!) so that she doesn't associate being let out with her whining and barking. At night, set up a routine for her bedtime and stick to it. Make sure that she's had a potty break last thing at night, then put her in her crate (and put it wherever you feel is best, although I'd tend not to put it too far away from you all as that may increase her distress. Perhaps the kitchen or laundry room, with the door closed!) and say goodnight. I use a light blanket to cover the crate at night, as it signals that this is bedtime and different from daytime crated periods. It won't make a difference at first, but your pup will learn to associate it with sleeping eventually. Don't go back to her, or talk to her etc. when she cries, except for potty breaks. At only 8 weeks she is likely to still need 2 breaks at night for a bit longer, she will reduce that to 1 in a couple of weeks, and eventually she'll be able to 'hold it' all night. Although she's barking and yelping and upset, she will eventually learn that you come back and that she has to stay there. And you just have to grit your teeth and put up with the noise for a bit longer I'm afraid, there really isn't any other way. An old T-shirt or something similar with your scent on it may help her, and a sturdy safe chew toy for her to take out her anxiety on also helps. Other than that it's a matter of time and patience. 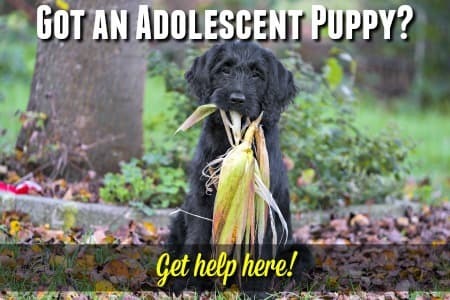 It's possible that because your pup is so young that she's been experiencing a bit of separation anxiety, but it doesn't sound as though it's anything above what's normal for a puppy when they come to their new home at first. Comments for Puppy cries for hours when put in the crate! We started, yesterday, putting her in her crate for short periods of time...always when she was sleepy. She went in and stayed willingly. As soon as she woke up, we let her out. The last 2 nights have been a bit better. The longest crying session is at the beginning of the night but after going potty it is minor. I do think we are moving in the right direction! I felt so bad when I realized she was so young, I wouldn't have taken her had I known. I know that she definitely sees me as her mommy now. I too believe that, after reading your page on separation anxiety, that she could be dealing with it a bit. She has never been left alone in the house yet since getting her. This will change this weekend as our routines start back (church, school for the kiddos). We've been breeding and selling puppies for over 20 years and I always send home a stuffed animal that each pup and it's littermates/mommy has been in touch with as well. I insist that the buyers place this toy in the crate EACH time the pup is put there. It's amazing how much this helps. Most pups grow up with that still being their favorite toy to sleep with. I agree with the other suggestions but there's one thing we do if we keep a puppy for ourselves or just have to keep one longer till the family is ready to pick it up, saying the rest of the litter is already gone. We place a crate for the pup to sleep in, right beside my bed where it can be close to me, be comforted by me and I will also be able to hear it if it should cry to go potty! You have to learn how NOT to respond to every whine but to decipher the difference in " please let me know you are there", and "Hey...I have to go POTTY !" NEVER play with your puppy or let it eat or drink when you bring it back inside after it's "potty break" ..You will create a monster! Good Luck and sometimes you just have start FROM SCRATCH and do the whole thing over again! 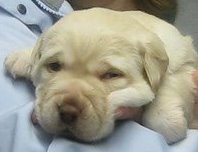 We have a 7 wk male yellow lab, have not gotten a crate yet, but put him in a good size box at night and for naps during the day. He cried the first night like crazy and kept us up. The next night we put a bear pillow in the box with him and he slept like a baby. The stuffed bear pillow helped him to feel safe and comfortable and now during the day when he is tired and in need of a nap he wants to be in the box with his stuffed friend. The only thing we say when it is bedtime is 'NITE, if he starts to jump up and down when first put in there, we just repeat the words and it did not take long, 3 days, before he was on schedule. I will be crate training my 10 week old; obviously I'll take her out in the morning when she wakes up... then feed her... but I've heard puppies need to go to the bathroom about 15 minutes after eating. Should I then take her out AGAIN after eating before I leave for work (all of which will occur within 45 min) or right after waking up is enough? Thanks! At 10 weeks old she'll have basic bladder/bowel control but won't be able to 'hold it' for more than a few minutes if she really needs to 'go'. This Puppy Crate Training Schedule will help. I'd also recommend that you check out my Crate Training and Potty Training pages as they have tons of tips and advice to help you. 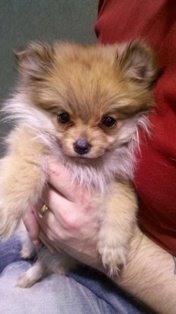 My pup is a female Pomeranian 12 weeks old,have had just few days, we have no children or other pets. We are gone for 11 hours each day except for weekends. Have proper size crate,soft towel toy and chew bone are in it. We leave radio on small room light on at night and facing window during day time hours. The pup goes crazy in pen will howl and whine for hours,till it wears it self out. I know that is a long time to be crated but what should we do ? thank you for giving any suggestions. 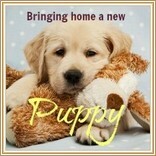 Firstly, 11 hours is too long to crate a young puppy every day, and I'd recommend that you try to find an alternative. If you could have someone come to your home midday to let her out for a potty break and some exercise that would help. Maybe a relative, friend or neighbor or perhaps a petsitter would help. Or once she's fully vaccinated a doggie-daycare would be a good option. Other than that, any puppies get upset at first when they're crated, but it sounds as though yours may be suffering from some degree of separation anxiety. It could be something that she's predisposed to due to a nervous or anxious nature, or it could be because she's being crated for such long periods that it is causing her to be very stressed. Crate Training is an important part of housebreaking and I'm not recommending that you stop using the crate altogether, just that she doesn't spend such long uninterrupted periods in it while she's so young. I don't normally recommend using pee-pee pads or a doggie litter box unless it's the only option, but for such long periods with a young puppy, using the litter box in a playpen or confining her to a small, puppy-proofed room, may be a better solution for the next month or so. As she matures, her bladder and bowel control will improve, and if you continue to crate her, but for shorter periods, her tolerance for the crate should also improve. This will make it easier for you to crate her during your workdays once she's a bit older. Hope this helps, best of luck with her. I am a teacher and have a 14 week old silky terrier. She has taken wonderfully to crate training and we have had no accidents (yet). I will be going back to work in 3 weeks and unable to take her out from 8 until 2:30. I do not expect her to hold it that long. What can I do that will not undermine the progress she has made so far? By the time you actually go back to work, your pup will be about 17 weeks old, and at that age she most likely could hold it for that number of hours. If you feel that you don't want to risk it, could you find a friend/relative/neighbor that would be willing to come to your home and take her out mid morning? Failing that, a petsitter would work. Or maybe you could find a 'doggy daycare' for her while you work. It sounds as though both of you have done a wonderful job so far, so best of luck in the future! I have a yorkie/silky terrier mix that I got from a local breeder. He was 5 months old when I got him. Crate training has been a nightmare. Since I've had him (about 2 months) he will not do his business outside even after walking extensively and taking him out very often. He will only go if he is inside a wire crate. I have taken the bottom of the crate apart and put in the yard. He only does his pottying inside the crate and with the door shut only. I've left him in the fenced in backyard outside of the crate to see if maybe he will go for hours on end. He will hold it until I put him back inside the crate and instantly will potty when locked back inside it. I have to pick up the crate and move it instantly or he will walk through it repeatedly. During the day I put him in a pet taxi and he usually goes in there, too. I have noticed some anxiety with him, too, as if I have to walk outside and he's at the glass door he will wet all over it while he paces and cries. Puppy pads are not an option either as all he does with those is shred them. People say they can't hold it forever if you walk them long enough, but I promise you, this one does. He is the sweetest, lovable, precious puppy but I am at a loss for words on how to train him. Can anyone help? I'm not sure where you got your puppy from, but it sounds as though the poor mite has had a difficult start. I would guess he was confined to his crate for extensive periods, and eliminated in there. He likely also had little chance to be out of that crate and poor socialization. 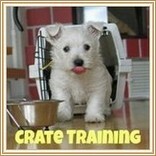 Without that type of history an older pup or dog is usually not difficult to train using a crate. You're doing a great job so far, and he's VERY lucky to have found such a loving home and understanding 'mom'. However, this has got to be very frustrating and worrying for you. I'm impressed with your creativity in dealing with his issues and I think given time and the correct help, you will be able to overcome his issues. Separation anxiety seems to factor in here too, and is likely complicating the problem. I'm afraid that this is beyond the scope of everyday advice on housebreaking as these habits are ingrained in him and linked to anxiety. 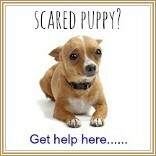 But I think a dog behaviorist will be able to help you overcome your dogs' issues. Your veterinarian should be able to recommend at least one in your area, or call a local dog obedience school for direction.